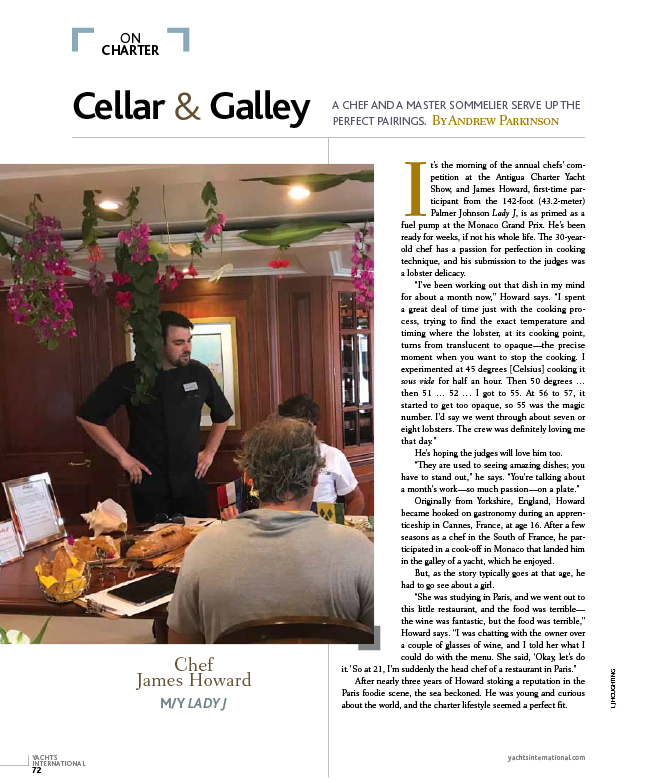 It’s the morning of the annual chefs’ competition at the Antigua Charter Yacht Show, and James Howard, first-time participant from the 142-foot (43.2-meter) Palmer Johnson Lady J, is as primed as a fuel pump at the Monaco Grand Prix. He’s been ready for weeks, if not his whole life. The 30-yearold chef has a passion for perfection in cooking technique, and his submission to the judges was a lobster delicacy. “They are used to seeing amazing dishes; you have to stand out,” he says. “You’re talking about a month’s work—so much passion—on a plate.” Originally from Yorkshire, England, Howard became hooked on gastronomy during an apprenticeship in Cannes, France, at age 16. After a few seasons as a chef in the South of France, he participated in a cook-off in Monaco that landed him in the galley of a yacht, which he enjoyed. Reprinted with permission from Boat International, Nov 2017. St Lucia’s rainforest-cloaked hills and plunging coastline hide endless treasures for those in the know. Cécile Gauert rediscovers the island’s chartering charms on board Lady J.
I have just touched the top of St Lucia’s vertiginous Petit Piton and I did not even break a sweat. There is more than one way to get up close to this iconic rock: the hard way, with hiking shoes and ropes; or the easy way. Fortunately, the captain of Lady J, on charter in the Caribbean, has arranged for his guests to try the latter. After a fast, dry ride on Lady J’s 31ft Intrepid tender to the pretty Sugar Beach, my companions and I, giddy from our first night aboard the 141ft Palmer Johnson, pile into a van for the journey up the winding road that leads to the Tet Paul Nature Trail. Rufina, a native of the nearby village, guides us along the path, a young mother hen to a flock of tootling tourists. She rattles off the names of plants along the way: “This is the guigui tree, or porcupine tree. It is very spiky. Be careful as you are passing by.” Birds seem to chirp in response to her clear laugh. Early the next morning I spin away on an exercise bike the crew has set up on the yacht’s sundeck, watching wispy clouds wreathe the emerald slopes. We share the anchorage in front of Sugar Beach, the Viceroy beach resort that was formerly the Jalousie Plantation, with only one other yacht. St Lucia, for all its beauty, numerous diving spots and two very good marinas, is not a magnet for superyachts, although the government is trying to change that by promoting the fairly liberal regulations relating to private and charter yachts. But it does take a bit more dedication to visit here than other traditional charter destinations. Getting to this island requires cruising through some deep water, and winter winds can make passages rough. The famous breezes, great for regattas, are not always ideal for serene passages on superyachts. Our original charter plan followed Captain Rayner’s favorite itinerary, from St Lucia to Tobago Cay and the Grenadines, but the forecast forced him to reconsider and stick to a lovely stretch of St Lucia’s coast. "I think St Lucia attracts your most adventurous type, people who are into diving, hiking, and want to see the more rugged sort of Caribbean." St Lucia is the third largest of the five major Windward Islands and, at 238 square miles, it really is quite small. The longest distance as the crow flies from north to south is 27 miles, and from east to west is 14 miles. A few roads snake around big hills covered with thick jungle. It shares natural and topographical similarities with Martinique, the island 25 miles to the north, but St Lucia is far less developed, particularly when it comes to its infrastructure. Thankfully, it was not affected by hurricane Irma and Maria. Its topography may be why the fierce Caribs fared better here than on other islands. But it did not prevent St Lucia from getting caught in the tug of war of imperialism, a history embedded in the culture. The official language is English, which Derek Walcott, the late poet, playwright and the island’s Nobel laureate, used masterfully, but a colorful patois is also widely spoken, and French names pepper the map. The island’s beauty and natural volcanic treasures were also said to have attracted to St Lucia the first wife of Napoleon Bonaparte, Empress Josephine, whose father had an estate here. Alongside its adventure credentials and rich history, wellness is also very much at the heart of tourism here and the island is dotted with resorts and spas offering treatments that incorporate local products. A tempting “sweet surrender” chocolate wrap is on the menu at laidback Ti Kaye Resort & Spa, which clings to the steep hill above Anse Cochon. More treats are on offer at Capella Marigot Bay Resort and Marina, which Lady J often calls home when in St Lucia. One of the Caribbean’s prettiest bays, its water turns from jade to gold as the sun descends at the end of the afternoon, and the humming of motorboats is soon replaced with the sound of tree frogs and music ricocheting across the water from a casual bar named Doolittle’s. The Auriga Spa at Capella offers an enticing honey and nutmeg exfoliation treatment and traditional rub techniques, exclusive to St Lucia and involving bamboo sticks. I decide to continue my exploration in wellbeing with a tasting of some of St Lucia’s molasses-based rums aged in Bourbon barrels at Capella resort’s rum cave. I have no trouble any evening falling asleep between recently refurbished Lady J’s silky sheets (made from the finest long staple combed 100 per cent Egyptian cotton). Fortunately, it’s only a short walk to the dock from this rum haven. If you don’t plan on being tucked up in one of five cabins by 10pm, head to the north-west end of the island, which is especially lively at the end of the week. Fish Fry Jump Up Fridays expunge the stresses of the working week with free-flowing Piton beer or spiced rum, served with fried fish or chicken, and music getting louder as the night advances. It is particularly lively in Castries near Rodney Bay, home to the island’s original superyacht marina, now part of the IGY marina network. "We are treated to lunch at Jade Mountain, overlooking the Pitons. I sip green gazpacho and take in the view." Our program in St Lucia blends great onshore and onboard experiences. We are treated to lunch at Jade Mountain, Nick Troubetzkoy’s spectacular resort overlooking the Pitons. I sip green gazpacho and take in the view, one of St Lucia’s best. Next stop is the resort’s chocolate lab, where we are shown how to transform chocolate from the nearby Emerald Estate into fudge bars. The chef on Lady J also uses the local chocolate to create sweets, truffles and other sinful treats. He sends these from the galley after each meal, no matter how elaborate and even after a seven course wine pairing menu. My favorite among the delicious offerings this evening is the pairing of a Chilean pinot noir with forest mushroom and truffle risotto. Each meal is a surprise, with fresh edible flowers, purple cotton candy, homemade goat’s cheese with seawater, and sweet or savory profiteroles, which the chef teaches us how to make in his galley. Lady J’s incursions into the picturesque bays of St Lucia’s west coast prove equally full of surprises. The crew organizes a barbecue lunch on a small beach near the fishing village of Canaries, a place that is just as colorful as the birds of that name. The long table set on a narrow stretch of sand affords views of strewn driftwood, as if cast by an artist’s hand, against a backdrop of clear waves and deeper blues further out. A couple of villagers engage the crew in some banter for a while, but then leave us to enjoy a feast on their beach. We cruise just a few miles along the coast, from Marigot Bay to Rodney Bay and back, but it feels like we’ve traveled quite far and ventured way off the beaten path. St Lucia is still a pristine experience, a taste of the authentic Caribbean, a delicious blend of nature and laid-back luxury. I’d recommend that you go now while it still is a bit of a secret. Just make sure you don’t tell anyone else. We're pleased to welcome you to the new website for 142' Palmer Johnson Motoryacht Lady J. 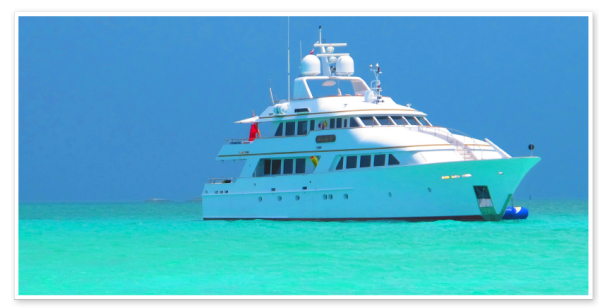 Lady J accommodates 12 guests in 5 spacious staterooms and is ready to take you on an unforgettable luxury yacht charter vacation to the Bahamas, the Caribbean and beyond. We invite you to explore and discover our photo gallery, tour the luxurious interior, check out the many activities that are possible while on charter, study the deck arrangement and full specifications, review sample travel itineraries and meet your five star professional crew who are eager to cater to your whims and make your holiday absolutely spectacular. 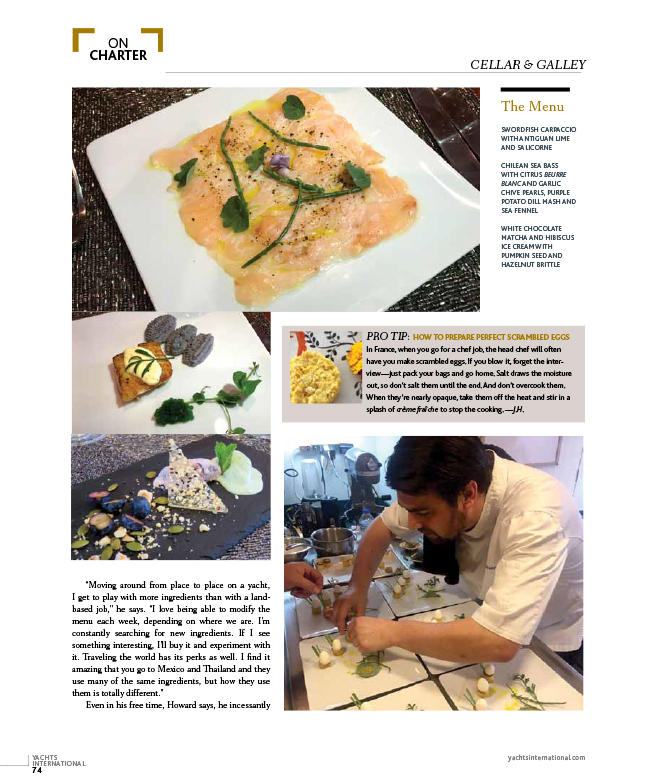 Visit us often for updates, media features, culinary updates and more. Just when we thought the crews couldn't get any better we unanimously have decided that this was the best crew yet! We loved them!!! And of course we loved the Lady J. Truly fantastic! The Islands of the Turks and Caicos are a unique Caribbean destination for luxury yacht charters, and 142’ Palmer Johnson M/Y Lady J recently hosted friends from ShowBoats International Magazine who discovered the aquamarine waters of the area while being pampered by the professional crew. 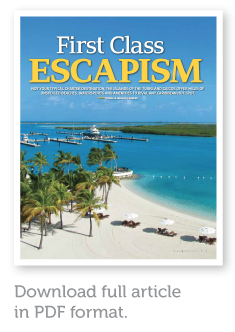 We invite you to read the article below and download the full 5-page PDF (complete with photos, maps, and extra details) to learn more about this magical corner of the Caribbean and the most delightful way of exploring this tropical spot, your own Lady J luxury yacht charter. To me, one of the most fascinating aspects of travel is meeting expats—people who took everything they cherished in their lives and moved to a vacation destination or to the middle of nowhere. Maybe they wanted to get away from a too-hectic life. Maybe they always had itchy feet as nomads meant to absorb as much of the world as possible. I’ve always been somewhat jealous of these types. But that is also the nature of the yachting lifestyle, isn’t it? Having the ability to move from one destination to another by simply picking a point on a map and saying, “I want to go there.” The Turks and Caicos is such a destination. Many people you meet are not from there and those who are typically only are second or third generation. Aside from long-time Turks islanders, many residents first came to this British Overseas Territory on vacation and vowed to move here. Who could blame them? There’s nearly 350 days of sunshine and with miles of uninhabited beachfront property, your neighbor could be anywhere from mere feet away to miles down the beach. Now, Providenciales, or Provo as it is affectionately nicknamed, the territory’s most developed island and largest town, is not what you would call a bustling city or business center—everything here caters to the tourist. You can move from hotel to hotel, availing yourself of each one’s facilities. You’re staying aboard your yacht in Blue Haven but want to use the spa at Amanyara? No problem. Heard that the breakfast at The Beach House was first rate? Well, then by all means, it can be arranged for tomorrow morning with no fuss. The stretch of beach at Grace Bay has been voted time and time again as the world’s best and you can have beach chairs and lunch set up at The Alexandra Resort on that famous beach tomorrow. Nowhere have I seen so many hotels working together like a network, all willing to share in the wealth of and cater to the visitor. Located 575 miles from Miami, Florida, south of The Bahamas chain and north of Hispaniola, the Turks and Caicos has traditionally been a stopping point for refueling and provisioning rather than a large-yacht destination. IGY Marinas looks to change that. The international group manages the marina part of the newly renovated Blue Haven Resort and Marina, the former Nikki Beach resort on Provo’s northwestern tip. Catering to yachts up to 220 feet, the marina began welcoming yachts in summer 2013 before the grand opening in December. We spent a night here, sampling the marina’s and island’s many amenities before boarding the 142-foot Palmer Johnson Lady J, our host for the next three days. While the aquamarine waters of the Turks and Caicos beckoned the next day, so did the island’s delights. We began by taking a conchcracking lesson at Da Conch Shack and then sampled some of the ubiquitous conch ceviche, which was lemony and superb, some of the best and freshest I’ve had. We then moved on to afternoon drinks at the Grace Bay Club, one of the island’s adults-only resorts. Grace Bay Club has everything from a beachfront pop-up restaurant and bar to the Caribbean’s longest bar: 90 feet long with an infinity edge that stretches it even farther into the horizon. On land, there aren’t many attractions beyond hotel amenities, but there are biking trails, some shopping in Grace Bay and high-end restaurants. Also, bird watching is given high marks. Watching flamingos frolicking in their natural habitat at the aptly named Flamingo Lake—also popular with anglers for bonefishing—enthralled me. The best sighting opportunities, however, are on North, Middle and East Caicos, where you can see plenty of flamingos in the lagoons, salt ponds and mangrove wetlands, along with more than 170 bird species. An afternoon helicopter flight over Provo revealed abundant undeveloped land between the many resorts that dot the islands and beachfront properties belonging to celebrities like Donna Karan, Bruce Willis, Oprah Winfrey and Keith Richards. They find here a sanctuary-like atmosphere that’s conveniently close to the States. We crisscrossed over miles of empty beaches, secluded bays and waters so blue they looked like someone had dropped food coloring in them. The barrier reef that surrounds the islands, the world’s third largest barrier reef, creates a mirror-flat sea. We caught sight of a couple of kitesurfers taking advantage of the area’s trade winds and shallow beaches ideally suited to the sport. We returned to Blue Haven Marina to board Lady J, eagerly anticipating our own sojourn and ready to get out on the water. Captain Stephen Bay leads the seasoned crew aboard Lady J. They are all watersports enthusiasts and were ready to show us the best of anchorages for a week of activities. After a short cruise to the Northwest Point anchorage, we tendered to land for lunch and a spa treatment at the Amanyara resort. The resort sits inside two protected areas comprising 5,000 acres, the Northwest Point Marine Natural Park and Pond Nature Reserve, and is one of the most serene places I have ever visited. Wedged into natural surroundings, Amanyara feels more like Thailand or Bali than the British West Indies, although continuing that Robinson Crusoe-lost-in-paradise feel. We returned aboard for an afternoon of watersports, swimming and snorkeling off of Amanyara where, just beyond the barrier reef, a 6,888-foot drop along the ocean floor forms an ideal wall for diving. The next two days went by in a flash. While some of the ladies partook of another spa experience, this time at the Regent Palms Turks & Caicos, others enjoyed an afternoon of sportfishing, which is superb in this area. South Caicos is a renowned spot for lobster and conch. Captain Bay and crew are avid fishermen and returned from a short jaunt with no less than five three-footers in hand. Their appetites whetted, they planned for an afternoon of bonefishing upon their return to Blue Haven Marina. One afternoon, the crew took us all aboard Lady J’s 32-foot Intrepid for a beach picnic on Fort George Cay. Uninhabited and a protected national park, this tiny cay was once a fortified island that protected the waters from pirates. Snorkelers easily can spot 19th century cannons lying underwater among swirling shades of turquoise and natural sandbars appearing at low tide. As Lady J made her way south to the more typical charter destination of the British Virgin Islands, Captain Bay vowed to return at the end of the charter season. The Turks and Caicos had proven to be a worthy spot, a little slice of heaven away from the Caribbean’s crowded docks. I promised to come back as well. Who knows, maybe you’ll find me here five years from now, a true expat, having left the rat race and living the dream. Lady J’s award-winning Chef Nathaniel Cox places 3rd in Antigua’s Concours de Chef contest. 142’ Palmer Johnson M/Y Lady J is very proud of its star chef Nathaniel Cox who recently placed 3rd in the prestigious Concours de Chef Contest in Antigua, in the Yacht Category (101'–159'). For the competition the vegan-themed menu was judged with a criteria that included Plant-Based Haute Cuisine and Caribbean Luncheon. Renowned Chef Chad Sarno, VP of Culinary Wellness at Rouxbe Online Cooking School was on the judging panel. In current times, healthy cuisine does not mean a sacrifice in taste or a lack of high-end presentation. This year the well known contest challenged the skills of participating chefs by requiring solely plant-based cuisine. With the health crisis faced by most western countries, plant-based cuisine is not only trendy, but necessary. This year's competition asked chefs to showcase their best in the realm of plant-centered dishes while offering a healthy luncheon menu. 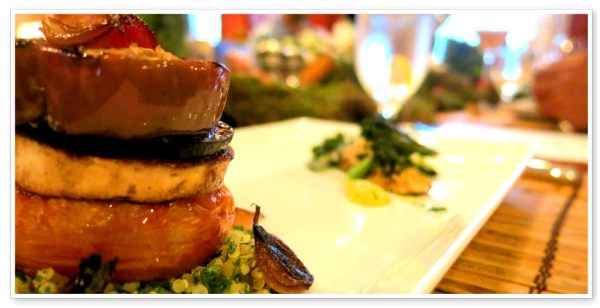 The challenge was to highlight the intersection of delicious and beautifully presented haute cuisine with a healthy plant-based menu. Judging criteria was based on presentation, creativity, taste and healthfulness of the overall menu presented, but other factors were taken into consideration. Galley sprouted mung bean, tamarind glazed grilled plantain, toasted hemp seed, avocado puree. Smoked tomato eggplant, tofu, beetroot jelly, quinoa tabouleh. Young coconut granita and flesh, papaya, passion fruit, kefir and kale sauce. Join us for a luxury yacht charter vacation onboard Lady J and experience the finest haute cuisine you have imagined. 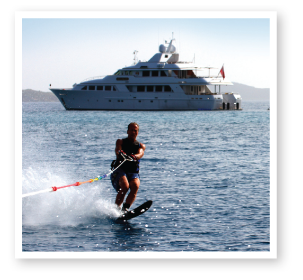 Fabulous guest reviews confirm that MY Lady J and its amazing crew offer a unique luxury charter vacation. Happy charter guests are the best proof that a yachting vacation onboard Lady J is one of the best holiday experiences you’ll ever have. The crew have collected comments written on the charter guest book, which we’d like to share with you for a very personal glimpse at the guests’ own perspective. We have changed the names of the families in order to protect their privacy, but we trust you’ll enjoy the tales of their activities, meals and excellent times aboard. We’ve just had a magical week onboard Lady J. The Captain and his crew set the perfect tone for the week. The Chef prepared every meal to perfection, from the table settings to every bite. The first officer provided daily adventures even when we kept him out on the water until sunset every night. Some highlights included: playing on the sandbar through sunset, swimming with the sharks, snorkeling the coves at Staniel Cay, jet skiing everywhere, water skiing, pirates taking over Lady J, movies on the upper deck, laughter and smiles from everyone (guests and staff :) all week long. Thank you all! My favorite thing was everything but my most favorite thing was tubing. My favorite thing was the great food and the fun water activities like jet skiing, fishing and jumping off. My favorite part was jet skiing, spending time with my family, the good food and Fourth of July. I had a lot of fun tubing, jet skiing, jumping and eating but my favorite part was watching the fire works in the harbor with my family and the crew. Thank you so much! The whole experience was amazing. I’m not sure we will ever be able to top this vacation. Everything was perfect. Thanks to the incredible crew for making this such a memorable week. Amazing time from beginning to end. The crew made this week that much more special. Thanks for everything! So sad to leave… But so glad to have been onboard to get to know you all! Special crew and talent abound. We had the best possible time on our Lady J adventure all because of the crew. Looking forward to seeing you again in the Bahamas. What a week! There is never a dull moment in the R family and we are so grateful to add the Lady J to our illustrious book of memories. The Captain and the crew gave us everything we could ask for and more. Lady J crew and friends, what a fantastic week we have had with my son’s engagement and celebrating my birthday in complete luxury. We are so grateful! Thank you all for being so amazing this week! We will always remember the Lady J since we shared a special celebration onboard. You guys are all so sweet and we couldn’t have asked for better staff. We hope to return soon. BRAVO! What an incredible crew that goes above and beyond the call of duty… over and over again! Thank you for spoiling our family like never before. 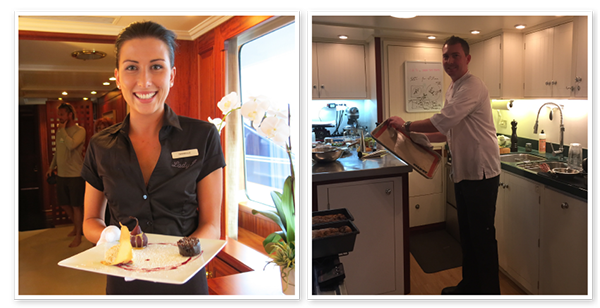 "The crew onboard Lady J each has such unique personalities and great smiles and social skills. They're amazingly fit, never stop moving, anticipate, and are always focused on the enjoyment, safety and happiness of the client and protection of the Lady J. I've thought about every aspect of our entire charter, looking for areas for improvement, and for all that is in your control I believe you're BEST IN CLASS. From the towels, linens, shampoo, body wash, toothbrush, laundry service, etc. to the wines, beer, drink of the day, food (selection, quality, prep and presentation), toys, facilities (Lady J herself), parting gift bag and favors....it's a world-class operation, without a doubt!" LADY J is currently in the shipyard, busy accomplishing a new paint job, several upgrades, plus a very important modification that will enable her two Twin Staterooms to be reconfigured in order to feature convertible Twins-to-Kings! As a very successful luxury charter yacht, the owners of this beautiful 142' Palmer Johnson, understand the importance of offering charter guests flexible arrangement options so that regardless of the size of the party, the ages of the guests, and the distribution of family and friends, each group can enjoy the spacious accommodations in the way that is most suitable to their plans for an exclusive vacation. 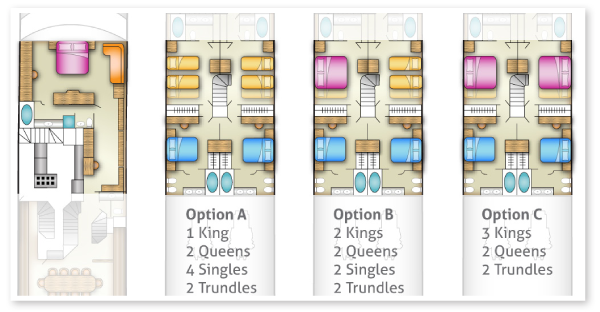 3 Kings, 2 Queens, 2 trundles. 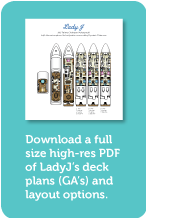 You are welcome to download a full-size high resolution PDF of LadyJ’s deck plans (GA’s) featuring the new layout options available. Also added to the impressive upgrades list is a 32' towed Intrepid tender! Chef Emma Beckett of 142' Palmer Johnson M/Y LADY J was recently awarded first place in the 101'–159' yacht category at the Concours de Chef Contest at the 50th Annual Antigua Charter Show, sponsored by Piper Heidsieck Champagne, Boat International Media, and LIAT Airlines. Emma is culinary trained and has worked in some of London’s top restaurants, most notably Gordon Ramsey’s Aubergine. She later moved on as sous-chef at Moving Venue—one of London’s largest private catering firms, working alongside a Roux trained Michelin star chef and catering events for up to 500. She has been a yacht chef for 9 years and has even started her own exquisite chocolate line “Bitter Chocolates”. 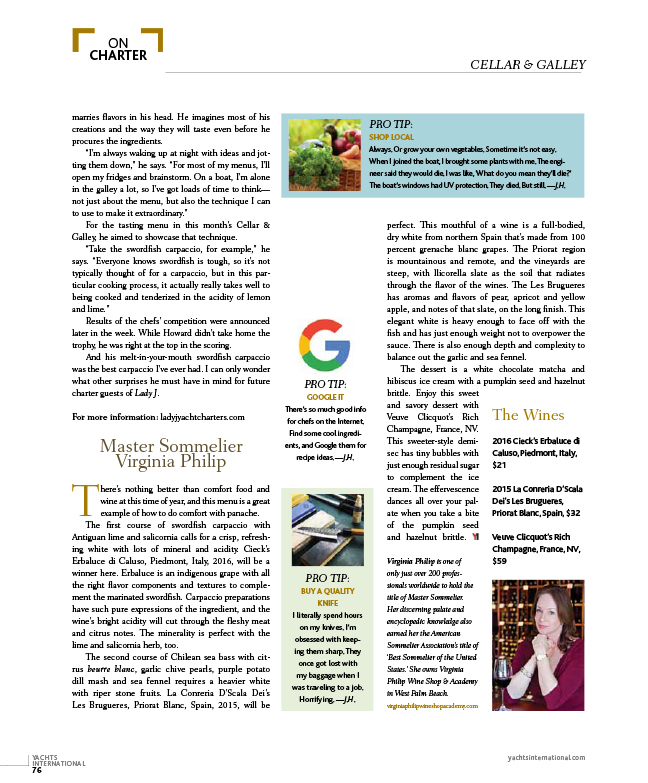 You are welcome to download Chef Emma’s Award Winning Menu in PDF format, from her famous “Papaya Green Chili Tini” to her “Thyme, Chili Salt Chocolate Torte”, this incredible menu is sure to stir your appetite and inspire your next meal. And if you’d like to sample any of these delicious options for yourself, come on board Lady J for your next luxury yacht charter vacation. LADY J wins 3 awards at the 50th Annual Antigua Charter Show! Chef Emma Becket of M/Y LADY J, 142’ Palmer Johnson, was awarded first place in the 101’-159’ yacht category Concours de Chef Contest sponsored by Piper Heidsieck Champagne, Boat International Media, and LIAT Airlines. 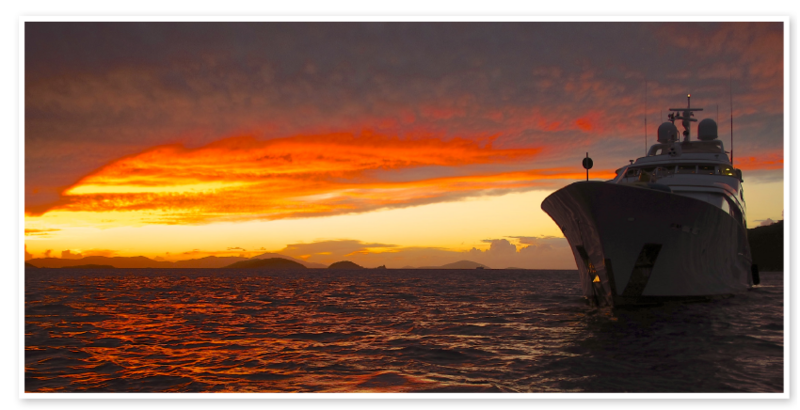 Also during the Antigua Charter Show, MTN Satellite Communications sponsored a photo competition and First Officer, Scot Fraser of M/Y LADY J, won the first place award for “most creative/artistic photo of a VSAT antenna”, as well as runner-up for “most interesting photo of use of communications”. This is the place to keep up-to-date on the charter activities of the Lady J. Available for charter; this 142 ft (43.3m) Palmer Johnson has just completed a refit that makes her better than ever for families or adult guests. Updates include interior furnishings and fabrics of exceptional quality and comfort as well as the addition of new water toys. As our summer season is winding down, we invite you to consider the Lady J for a tropical holiday this fall and winter. If you're thinking of a Thanksgiving in the Bahamas or New Year's in the Caribbean, now is the time to begin planning. The Lady J has select charter dates available this winter in some of the best yachting locations. December 2011 - LADY J has completed her first successful charter in the Bahamas and is now enroute to the Caribbean where she will debut at the 50th Annual Antigua Charter Show. I new 14' Aquascan jet tender has also been added to her inventory!